Enjoy one of our regularly scheduled bike tours in a more intimate setting with just your friends and/or family. This is a perfect choice for families, VIPs, or anyone looking for a more personal experience on DC’s top rated bike tour! Tour the National Mall on two wheels and see more in less time. On the day our your tour, your guide will give you two options for tour routes. You can choose to bike the National Mall from The Capitol Building to The Lincoln Memorial and "everything" in between OR you can have your ride focus on the monuments and memorials from the Washington Monument To Lincoln and then around the tidal basin. Our Capital Sites tour provides a great overview of the city and is great to take on day one or two of your trip. 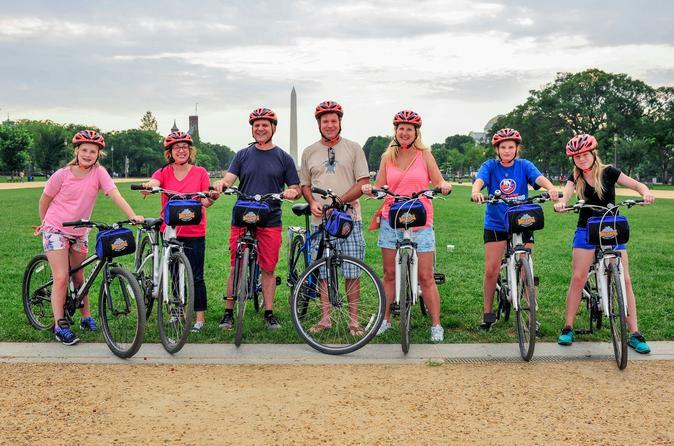 Your private groups will bike and learn about the major sites on and around the National Mall and Capitol Hill, including the Capitol Building, Supreme Court, Smithsonian Museums, World War II Memorial, the Washington Monument, and the Lincoln Memorial. Learn about interesting exhibits, local events, and practical touring tips from your guide. A great way to plan for the rest of your trip! This tour has a bit more riding and covers about 8 miles. For the most part, you will stay with your guide and your bike, while making frequent stops for information...and photos! Our Monuments tour covers the monuments and memorials on the National Mall and Potomac Tidal Basin. See the Washington Monument, Vietnam Veterans Memorial, World War II Memorial, Lincoln Memorial, Jefferson Memorial, the new Martin Luther King Jr Memorial, and more. This tour also gives you the chance to walk around and explore each of the memorials for a few minutes. If you are only in the city for a couple of days, this is the tour for you!